The report, commissioned by the BPF and produced by Turley, provides key recommendations for both the Government and property sector, to ensure enough warehouse space is built to sufficiently service new and growing communities across England. The Government must ensure proactive and well-informed policy and planning practice, which recognises the inextricable link between homes and warehousing, and the importance of the infrastructure to connect them. The British Property Federation (BPF) today published a report that examines the relationship between new housing and warehousing across England. 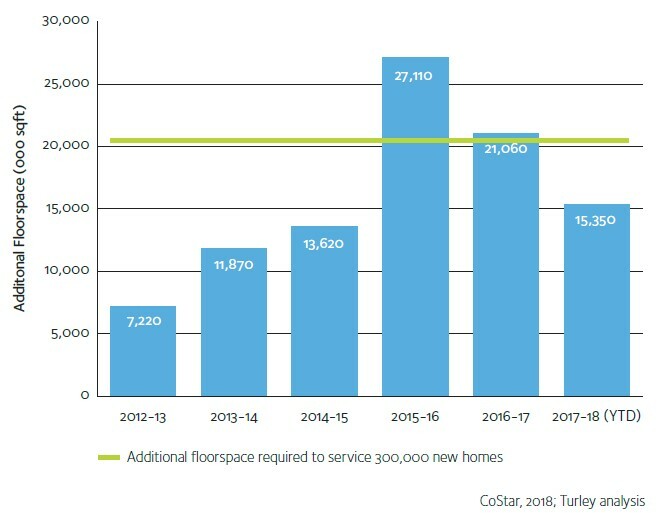 The report, What Warehousing Where, finds that there is currently 69 sq ft of warehouse floorspace per home in England – and to maintain this ratio, to match the Government’s target of 300,000 new homes a year, would require 20.6 million sq ft of additional warehouse floorspace annually. This is equivalent to 280 football pitches each year. Taking into consideration continuing growth of e-commerce and demand for last-mile delivery, this ratio of 69 sq ft will likely need to increase. The movement of goods to and from businesses and people is an integral element of the economy. Warehousing and logistics underpin the efficient operation of most, if not all, business sectors – and, to fulfil consumer demand and meet expectations for quicker deliveries, the right volume of warehousing space in the right locations, with the right transport infrastructure, is essential. Only two of the past six years, however, have seen total warehouse floorspace in England grow by more than 20 million sq ft. Chart 1: Historic Annual Warehouse Floorspace Growth (sq ft) Compared to Future Annual Need to Align with the Government’s Housing Target. The current ratio differs by geography – while the West Midlands is currently in the lead, boasting 111 sq ft of warehouse floorspace per home, London ranks last with only 40 sq ft. This demonstrates the Midlands’ role as a key national distribution hub and the more local role that warehousing plays, and the impact of constrained land supply, in the capital. The Prime Minister has made tackling the housing shortfall the top domestic priority for her and her Government, yet this report highlights that no formal recognition is given to the quantum and location of warehousing space required to support the Government’s commitment to build 300,000 new homes annually. As the population grows and more homes are delivered across the country, additional space for warehousing should be a central consideration when planning for sustainable communities. As part of the Government’s Modern Industrial Strategy, the Government should set a requirement for all Local Industrial Strategies to specifically consider the role of their geographic area in the national logistics network and identify steps to support its efficient and sustainable operation. The logistics sector, including developers, operators and industry representatives, must seek to positively engage at all levels of plan making including Local Plans, Local Industrial Strategies and through engagement in government growth areas to demonstrate its requirements and the role it will play in delivering sustainable places. “Few realise what a vital part warehousing and the logistics sector plays in our everyday lives. Warehousing does more than just ensure that online deliveries arrive on time, it also creates skilled jobs and delivers significant economic growth. The Government is under a lot of pressure to deliver new housing – and while this is important, a balanced approach to planning for sustainable communities must be taken. “We have, for the first time, a marker of the relationship between homes and warehousing across England. As a country we can now take a more informed approach to planning for sustainable communities as our population and housing grows.